Tax bills are perceived, by many wealthy entrepreneurs, as the slicing guillotine blade of government. 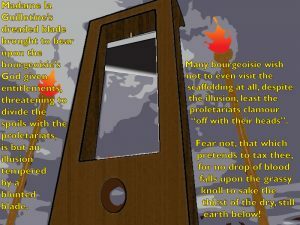 Ever since the French introduced Madame la Guillotine’s blade as their historical precedent for resolving differences with the wealthy upper class, the wealthy 1% have been understandably nervous. Anything that separates them from their beloved wealth irks them mightily. They traditionally hold it securely, so none of it can trickle out or hide it in havens, lest any be taken from them. To settle the proletariats, the government must be observed to be taxing the bourgeois, without actually removing their entitlements to wealth. The Liberal Party’s 2016 budget is an illusion of mastery of this particular magic. Allow me to paint a scenario. The stage is dark. The white haired magician enters stage left. He is tall, imposing with a smug look of self-assurance. All born of the certainty this is a trick he has had much personal experience. Having performed it in Panama, the Cayman and the Virgin Islands. Doing it before an Australian audience of stupefied Aussies should be a milk run. Malcolm the Magnificent waves his hands and the lights fall upon Madame la Guillotine. It’s fearsome blade poised over a skimpily covered, but not too revealing $100 bill. Dame Nelly bats her eyelids and smiles up at the poised blade. All eyes watch as the blade descends, threatening to tax Dame Nellie Melba, right before our very eyes. The Government’s latest trick is the traditional guillotine illusion where the blade falls upon the “victim”, but nothing is cut off. Tax cuts and tax management were a predominant topic of the Budget. Shaving off a little less for the not even 1/5th of the taxpayers that earn over $80K but apparently pursuing deeper cuts from they that hoard their treasures. Certainly, none of the Liberal Party’s largest donors in the corporate world wants to have Madame la Guillotine chop their perceived entitlements. In fact many corporations and wealthy bourgeoisie protest and quite legitimately, to ATO auditors that everything is above board and legal. Let us consider the three primary ways that companies avoid Madame la Guillotine’s taxing burden. The basics for facilitating reduction of their taxes. Offshore Registration of your business in a foreign municipality with a cheaper rate of Tax aids companies in avoiding tax in the country wherein they may do business. Transfer Pricing makes use of a subsidiary firm ­- again in a foreign country with cheaper tax rates – in which that firm is the official sales agent. An agent is selling your Australian product. Much like Google does by selling Australians advertising locally (to the tune of $2 Billion in 2015). Although it is officially billed to Singapore where they pay only 2.5% tax (or $5M). The business pays reduced tax on profits acquired at the foreign rate, not the local rate. It’s essentially a legal means of money laundering. Debt Loading – where your foreign holding company lends money to your subsidiaries in Australia. In the latter case, the Australian firm pays back the “loan” at crippling interest rates reducing any profits the company would otherwise make. As a result of this “loan sharking” manoeuvre, profits vanish. Often the interest acquired overseas is not even taxed at all. All their hard earned profits disappear in a puff of smoke. The cabinet that cute little tax dollar walked into, is reopened, to reveal the cupboard is bare. Nothing to tax here! This disappearing act is not unlike the magic performed by the “Murdoch the Mystic” when the Tax office held in their very hands the $882M that they had taken in tax from him. With a wave of his wand, the profit he made in Australia was relocated to foreign US shores. Before you could pronounce “expecto patronum”, the $882M had relocated itself back into Rupert Murdoch’s bank account. It was coincidental, of course, that this occurred during the election period, which resulted in Abbott being magically levitated onto the public stage as Prime Minister. Mr Hockey who was hysterically alarmed by our enormous national debt never raised the spectre of these funds vanishing from the public purse. Perhaps he was befuddled by the mind manipulating force that emanated from a Sith Lord. Apple booked $8B in revenue in Australia yet paid us only $85M. Something must have gone drastically wrong with their profit redirection to be paying as much as 1%. I am sure they have fixed the trap-door now, so everything vanishes down it cleanly. Certainly no longer leaving any caught sliver of clothing that the tax-man can scavenge. These corporate raiders have made use of the resources of our country. They pay for our labour (but not the development of it), transport (but not what it moves on), ports (but not their construction), power & rent (but not the infrastructure that supports it). 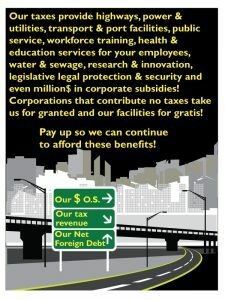 Every other small business in Australia pays for this as well, because the rest of us pay taxes! 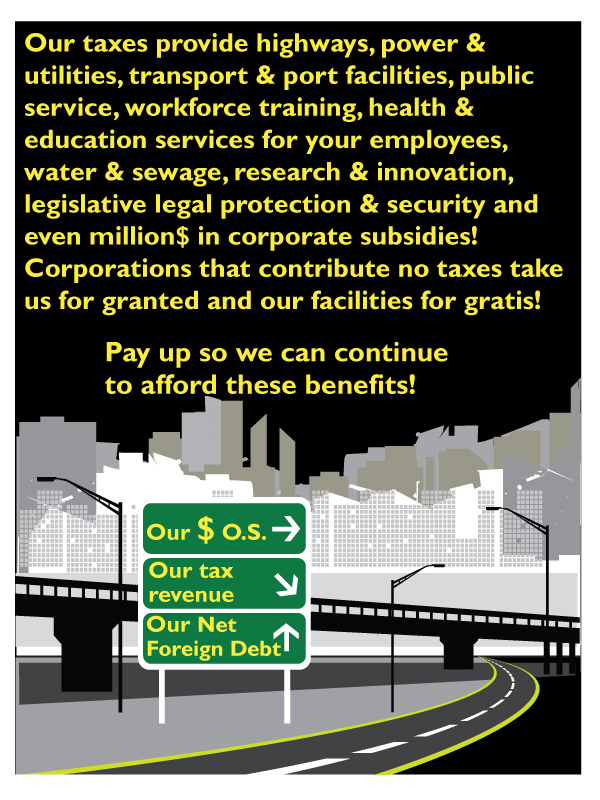 Taxes paid by their customers, employees, and even the staff that clean their offices. Individually any of these often pay more tax then have these companies. They are allowed to exploit our country by taking money (and sometimes resources, technology and/or minerals) out of the country. They deplete the wealth of this country for their profit but don’t pay the cost. It is no wonder we have a net foreign debt of 1 Trillion dollars with all that draining from the country. But does the blade cut anything? First off and the most obvious, 1300 newly minted Tax officers are hardly a replacement for the 4700 very experienced ATO officers that lost their jobs since Hockey cut their funding. They weren’t keeping up with the multinationals that weren’t paying tax when they had that many. Now they are short-changed by 4400 staff and have lost a world of experience. Less obvious is to what extent these new diverted profits laws are applied. These new laws came into effect on 1st Jan 2016 and applied where the annual turnover is more than $1Billion. This will positively affect Apple and Google, but many foreign interests who carry on through subsidiaries in Australia will not be affected. The only real targets will be the top mining and technology sectors where services, research or marketing performed in Australia is booked to overseas subsidiaries. What needs to be reiterated is companies like, Amazon, Google, Energy Australia, GE, Bhp Billiton, Facebook and the like, practice legal tax avoidance. They will modify their strategies, as booking transactions to overseas is just one strategy. Certainly, companies with $1 Billion in turnover can well afford to restructure and break their turnover up amongst multiple entities to go below the threshold. While an obvious strategy, I am sure they will come up with better ones. Remember none of their tax avoidance practices is illegal, immoral, yes, but not illegal. They may stonewall in Senate hearings because they are embarrassed and want to avoid public distaste and a drop off in profits, but they HAVE DONE NOTHING ILLEGAL. These Billion dollar turnover companies may lose a few locks of hair to Madame la Guillotine’s blade, but certainly no head. Unless the government changes the Law, to significantly cast, a wider net encompassing transactions made in Australia facing tax liability, not much will change. The falling blade of Madame la Guillotine’s blade is nothing more than another clever illusion. Mr Morrison’s taxing blade may apparently thrill your perverse appetite for expecting blood on the scaffolding. But the results will ultimately disappoint your blood lust. There is little hope of seeing the corporations and wealthy spill as much as one drop of their precious blood money into the dry, thirsty, cracked soil of the still economically barren landscape of Australia.